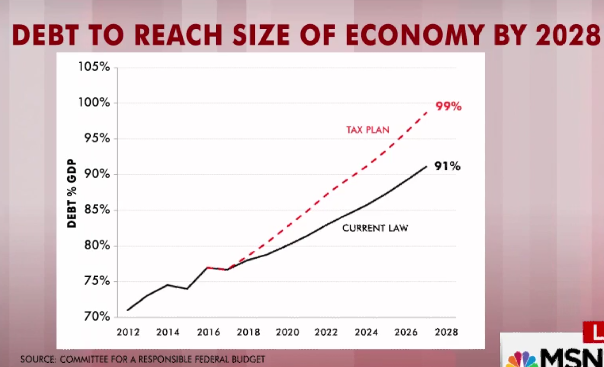 Republicans are lying as usual to push fake economics. This post outlines all these easy to debunk lies by Trump, the GOP and Fox News (& their right wing conspiracy theorist base). Robert Reich Runs Circles Around Trump's Former Economic Adviser Stephen Moore The former secretary of labor dismantles the myth that tax cuts boost the economy. “We did this in 2004; Steve Moore is acting like we didn’t have an experiment to test this theory. Under the George W. Bush administration, we did have a repatriation, a tax holiday and what did corporations do with all that extra money? Did they invest it? Create more jobs? No!” Reich explained. “They just brought back their shares of stock, pumped up share prices, provided more executive pay to the top executives—we’ve done it and we’ve seen that there are no results." Moore was undeterred by the facts and carried on with his dubious economic position. “Explain to me why it’s good for America that we have a 40 percent tax rate way up here and the rest of the world is at 20 percent down here,” he responded with gesticulation outside the camera frame. "It just doesn't work for America." Reich shut that argument down. “Well, it does because the effective tax rate—that is, what corporations are actually paying—is just about the same as other foreign corporations are paying." 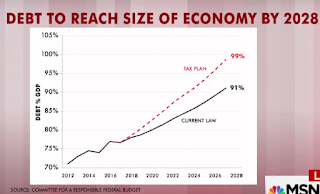 CNN's Brianna Keilar explains how GOP tax plans are "propped up by, frankly, dishonest math"
BRIANNA KEILAR: Yes, but Republicans, Jake, want to get this done. They need and they want a win ahead of a crucial midterm election. But their tax plans are propped up by, frankly, dishonest math. They violate the very promise that the GOP has made time and time again, that they will not saddle future generations with more debt. KEILAR: Republicans are championing a plan that many deficit hawks say is anything but fiscally responsible. The tax plan's $1.5 trillion price tag is a low-ball figure. It's the price tag they need to come under in order to use special Senate rules requiring them to need only 51 votes. The Committee for a Responsible Federal Budget, a fiscally conservative advocacy group, puts the real cost at $2.2 trillion. MAYA MACGUINEAS: There are a lot of gimmicks they're slipping into the bill to make the costs look less than they actually are. KEILAR: Here's one major gimmick: While the corporate tax cuts would be permanent, the tax cuts for American taxpayers would expire after ten years, on paper anyway, even though it's expected Congress would ultimately just make the cuts permanent. That fishy math allows Republicans to claim a smaller price tag. MACGUINEAS: On one hand, they're saying, "Sure there is all of these expiring tax breaks, but don't worry, we fully intend to extend them, and you won't have to worry about your taxes going up." And on the other hand, they're saying, "Don't worry about the cost of the bill. 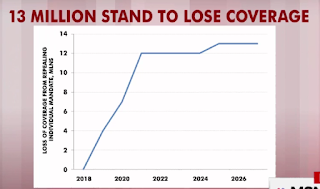 Sure, we're borrowing $1.5 trillion," -- which, I would say, everybody should be worrying about -- "But we're not going beyond that limit," when really, they are. 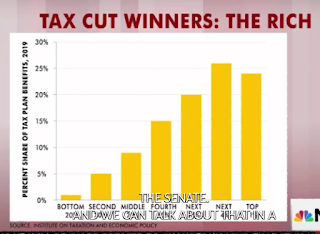 MSNBC hosts outline how GOP tax plan directly benefits Trump and the super rich Ali Velshi: Trump would "save millions" under GOP tax framework, while Trump heirs "stand to save over a billion dollars"
SEAN HANNITY (HOST): There are certain promises that presidents make and that politicians make that you just got to keep. And I guess sometimes it gets hard because they push, and they push, and they push, and they push. Democrats are also trying to set a trap on taxes. Now the president said yesterday, "Well, I think the wealthy -- their taxes are going to remain about the same. And if not they may go a little higher." He never said "a little higher" when he was running for office. Here is the problem with that. The president's plan to get the forgotten men and women to work here is basically contingent on a growing, thriving economy. Reagan slashed the top marginal rate in the course of his presidency from 70 to 28 percent. Revenues to the government doubled. Twenty million new jobs were created. And that was after the '82 recession -- I mean, he needed some time to get this thriving. And it worked. It's simple economics. Because those multinationals, those corporations, quote "rich people," what they're going to do is they're going to end up spending money and buying boats and as Geraldo said yesterday he bought a helicopter after the Reagan tax cuts, but that keeps people working. And then they'll build manufacturing centers and factories. And you know the top 1 percent already pay 39.5 percent of the federal income tax. The top 10 percent pays 70.9 percent. The bottom 50 percent pays nothing. And that's it. So the rich, quote, are already paying their fair share. The idea is to get them to spend their money and stimulate the economy and build the factories in Michigan, Wisconsin, Pennsylvania, and Ohio. Republicans Are Selling Their Tax Plan on a Platform of Lies Too many taxpayers hoping for a better future are going to lose out. President Trump and Republican lawmakers have been heralding their bill as a win for hard-working Americans, but the JCT report casts doubt on that claim. Tax increases for households earning $10,000 to $30,000 would start in 2021 and grow sharply from there, JCT found. By 2027, most Americans earning $75,000 a year or less would be forced to pay more in taxes, while people earning more than $100,000 a year would continue to pay less.